Please note: There will be a $250.00 cancellation fee and any eligible refunds are subject to Anna Maria Vacation��s ability to re-rent the accommodation at the price contracted. If the home is re-rented (partially or fully), we will issue a refund in the amount we were able to re-rent the property for, less the $250 cancellation fee. Eligible refunds will be determined based on the difference between the contracted amount and the re-rented price, less the $250 cancellation fee. This grand Victorian style Island home is luxury at its best! A newly constructed 4 bedroom, 2.5 bath elevated home with a private heated pool that is surrounded by tropical landscaping. It is a spacious cozy home that is great for a family get away. You will find Away to Play is a very short walk to the Gulf of Mexico - where you will find the sparkling water and white silky beaches of Anna Maria Island. 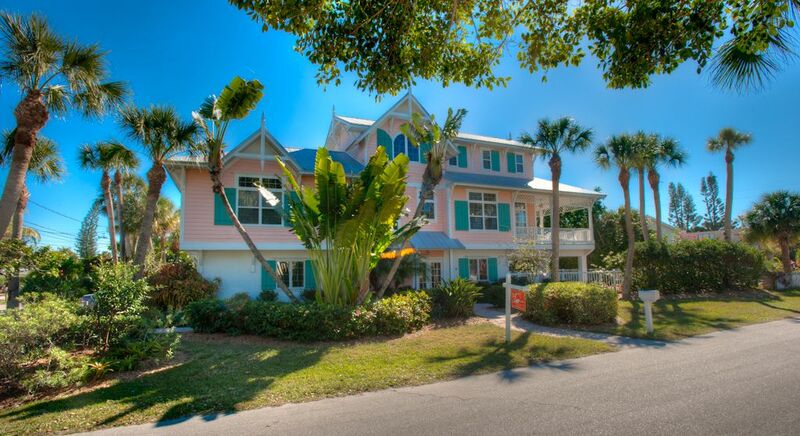 This property is just minutes away from Anna Maria Island's famous Pine Avenue. With plenty of shopping and restaurants, you're sure to have a blast and fall in love with the local spots. At almost 2,700 sq. feet, this home has plenty of space for a large group. It's a great property for a vacation for an extended family or two families looking to share a vacation of a lifetime. The Master suite on the top level features a King sized bed and your own private balcony which you can enjoy a peek of the Gulf while watching the sunsets. There is also a large walk-in shower in the master bathroom. Lots of porches, high ceilings, granite counters and fine amenities are what you will find with this vacation rental. Bathroom #1 has a full bathroom with 2 sinks and a walk-in shower. Bathroom #2 has a full bathroom with a glass door walk-in shower. Bathroom #3 is a half bathroom. The grill is a gas barbeque grill. There is a washer and dryer provided in the property.